A new video documentary on the life of Harold “Red” Grange, creatively told through the backdrop of the creation of a new Grange statue commissioned by the University of Illinois, has been recently produced by the University and broadcast on the Big Ten Network. Grange was a sports superstar that transformed professional football and helped firmly establish the National Football league. Together with C. C. Pyle, Grange became a model for sports celebrity, marketing and endorsements. 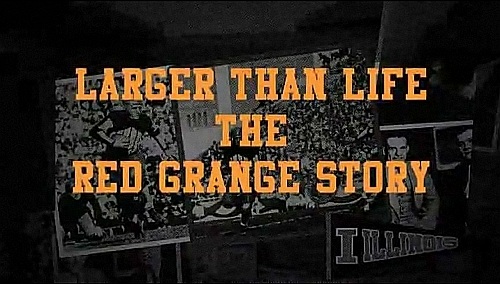 Now available online, the 45-minute long biographical production, Larger Than Life: the Red Grange story, weaves the story of Grange’s career with George Lundeen’s creation of the statue and is full of primary source materials and interviews with sports historians and other noted individuals. One of the historians interviewed is Gary Andrew Poole, author of The Galloping Ghost: Red Grange, an American football legend. As with Poole’s book, the University of Illinois utilized several images from the Grange collection that are unique to our holdings in its production.